For quantitative colorimetric kinetic determination of isocitrate dehydrogenase activity and evaluation of drug effects on its metabolism. • Fast and sensitive. Linear detection range (20 μL sample): 0.1 to 100 U/L for 30 min reaction. 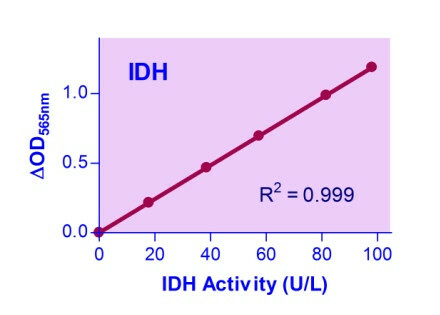 ISOCITRATE DEHYDROGENASE (IDH) is an enzyme which catalyzes the interconversion of isocitrate and a-ketoglutarate. There are three IDH isoforms: IDH3 uses the cofactor NAD+ and catalyzes the third step in the citric acid cycle, while IDH1 and IDH2 use the cofactor NADP+ and catalyze the same reaction outside the citric acid cycle. This kit measures the activity of the NADP+ isoforms. Mutations in IDH1 and IDH2 have been linked with various brain tumors and acute myeloid leukemia. BioAssay Systems’ non-radioactive, colorimetric IDH assay is based on the reduction of the tetrazolium salt MTT in a NADPH-coupled enzymatic reaction to a reduced form of MTT which exhibits an absorption maximum at 565 nm. The increase in absorbance at 565 nm is directly proportional to the enzyme activity. Applications For quantitative colorimetric kinetic determination of isocitrate dehydrogenase activity and evaluation of drug effects on its metabolism.